Whoever paid $3,207,852 for the most pristine known copy of Action Comics #1 must feel like a real dummy right now. “Ohh, I could have just read it online! What a goofball I am!” we assume that person is groaning, now that the appraisal organization that rated the copy’s quality at a near-perfect 9.0 has made a full digital scan available on its website. 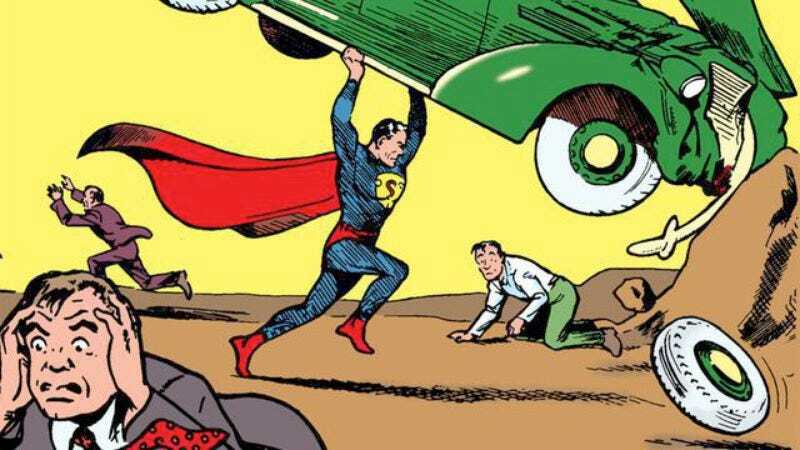 Certified Guaranty Company, whose quality ratings provide the basis for many comic-book valuations, has made available every last page of the issue that first introduced the world to Superman. Non-enthusiasts may be surprised to learn not only that Superman looks kind of like a doughy Josh Brolin in his first outing, but also that his tale is just a fraction of Action Comics #1, which also chronicles the, uh, less legendary adventures of Scoop Scanlon (“Five-Star Reporter”), Pep Morgan (boxer), and Sticky-Mitt Stimson (guy who steals apples), among others. Although the edition is possibly of higher quality than any other in the world, and certainly sold at a record price, it is not the most notorious copy of Action Comics #1. That honor belongs to a copy that famously belonged to none other than Nicolas Cage, until it was stolen from his home in 2000. Somehow, the thief—who, considering the comic’s then-owner, presumably had to cross at least one moat, scale a castle wall, answer a leprechaun guard’s three riddles, and swipe the book from under the pillow of a sleeping Nicolas Cage—allowed that edition to fall from his or her grasp, and it was found in an abandoned storage locker in 2011. Cage, after performing a harvest moon ritual with the comic in order to absorb its powers, subsequently sold it at auction for $2,161,000, a then-record price for a comic book, broken only by the recent eBay sale. Despite its greater monetary value, the copy that is newly available online has a less storied history, having been bought fresh off the presses in 1938 and then tossed into a cedar chest by its original owner, only to remain in that cool, dark, dry environment undisturbed for 40 years. It has changed hands among a small number of collectors since being rediscovered in the late 1970s. Its new owner has remained anonymous, though we do know that his or her eBay username begins with an ‘s’ and ends with a ‘p.’ So, congratulations, Meryl Streep! Something to rub in Cage’s face at the next Adaptation cast reunion.